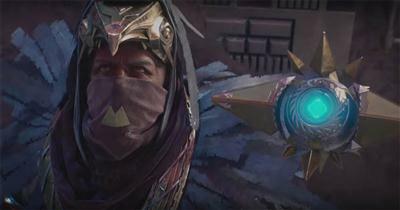 New to Destiny, Exotic weapon and armour blueprints make their first appearance in The Taken King expansion. These blueprints can be used to recreate any Exotic weapon or armour piece which you previously acquired, in exchange for an Exotic Shard and some Glimmer. The blueprints screen is split into two tabs; one for Collection 1 and another for Collection 2. Within Collection 1 the screen is divided into smaller groups containing Exotic slots/buttons for every Year 2 item and some Year 1 weapons (primary). Collection 2 contains the older Year 1 Exotic items and for weapons it's Special and Heavy types. Within each collection there are sub groups for each of the weapon types (such as Primary, Special and Heavy) and each of the armour slots (such as Helmet, Chest etc.). 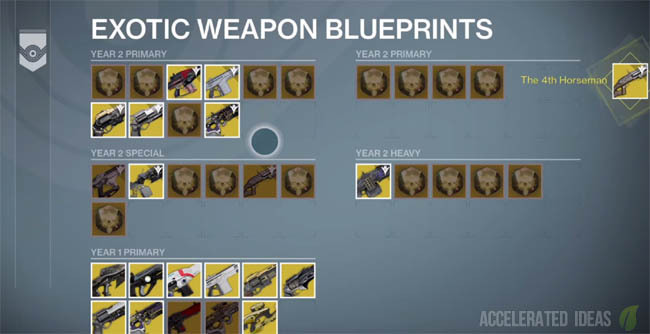 Blueprints can be used to recreate an Exotic which you accidently deleted in the past or to upgrade an older Year 1 Exotic to the new higher level Year 2 counterpart. Alternatively you can create an Exotic to pass on to your alternate character without having to wait for the Exotic to drop or for Xur to sell it again. Note: Bungie have a habit of changing these things so keep an eye on the terminals. The Exotic Blueprints screen can be accessed from any of the Terminals in the Tower. These are the little blue computer screens and a good example of one is in the lower level of the Tower, left hand side opposite the Crucible vendor. 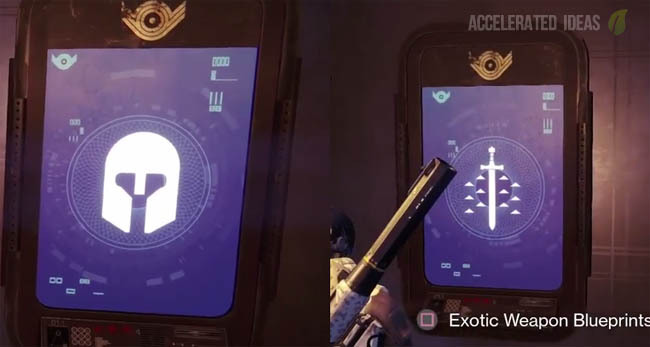 For the armour blueprints the terminal has a helmet icon and for weapons the icon is a sword. The image above shows the different types. You must access each one individually to create the necessary Year 2 Exotic weapon or armour piece.